Click the cover image below to download the Winter 2012 issue of the Nonprofit Quarterly. Should a board member who wants to be CEO resign from the board, or is taking a leave of absence sufficient? Is it an invasion of privacy to use a prospect research company to obtain information on a prospective donor? What is the best way to handle “closet bigots” in the office? And what should you do if concerns about your executive director’s charging unrelated expenses to grants fall on deaf ears? Our resident expert responds. How can we make board work more meaningful for serving members and more consequential for their organizations? This article proposes that nonprofit leaders are increasingly focused on secondary issues, and asks, What does the sector stand to gain as a result of retraining our focus from structural concerns to the central questions and principles of nonprofit governance? The most substantive decisions on your organization’s governance are likely happening far from the board room. How should your governance systems respond? What is it that enables boards to be strong and effective, and why are we still using outdated models in an effort to improve board performance? Financial Transactions with Your Board: Who Is Looking? In a first-of-its-kind study, nonprofits report on their transactions with board members—some for the better and some for the worse. A decade since the Sarbanes-Oxley Act first appeared, organizations still worry that aspects of the law will continue to seep into the sector. But doesn’t the sector actually have little to worry about and much to gain? It’s a wonder that social-movement networks survive long enough to make an impact. What’s the secret sauce of these organizing efforts? Does governance only reside in the board? Most of us know that it is more widely held than that, but few really design their governance systems to make full use of the intelligence and energies of their stakeholders. A board that can adopt this parliamentary concept can benefit from internal scrutiny and creativity that will ultimately strengthen its ability to achieve its mission. Whether by the book or ad-hoc, the defining feature of successful boards is not the model but the people who make it work. Do you know one when you see one? Initial research shows that there is a great deal of agreement about what makes a good board chair. 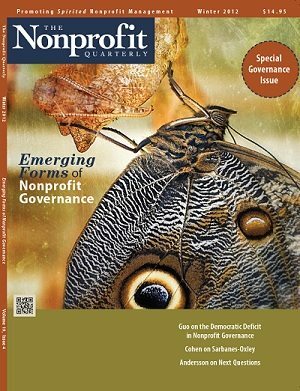 Several insights into the world of nonprofit governance have emerged in recent years, yet much remains to be explored. This article discusses five areas for future inquiry.